Fellowship recipients have the opportunity to attend and participate in a busy schedule of talks, seminars and a hands-on, one-day, ocean sampling cruise onboard the R/V Tioga focusing on data collection and sampling methods with advanced oceanographic technology and instruments. The cruise is especially designed for Fellows and not only provides practical training but also brings the group together socially through a shared field experience. Fellows also have many occasions to interact with current MIT/WHOI Joint Program graduate students, from the Q&A session designed specifically for that purpose to the Ethics in Science Workshop. WHOI actively recruits underrepresented minorities in ocean science as defined by the National Science Foundation (African-, Hispanic- and Native-Americans, and Pacific Islanders) in all of our education programs, as well as programs of the Woods Hole Diversity Initiative, such as the Woods Hole Partnership Education Program. More information can be obtained by contacting education@whoi.edu. Applications are accepted each year starting in mid-November through February 15. Photos of Summer Student Fellows working at the Institution and at sea. Follow Elaine Luo, a biology student from the University of Toronto, as she experiences life as a WHOI Summer Student Fellow. In 2017, 30 Summer Student Fellows representing 29 different U.S. and international colleges and universities spent their summer immersed in ocean science and engineering projects at WHOI. Read about some of their experiences and research projects here. In 2016, 32 Summer Student Fellows representing 25 different U.S. and international colleges and universities spent their summer immersed in ocean science and engineering projects at WHOI. Read about some of their experiences and research projects here. In 2015, 32 Summer Student Fellows representing 28 different U.S. and International colleges and universities were selected from over 200 applicants. Read about some of their experiences and research projects here. In 2014, 30 Summer Student Fellows representing 26 different U.S. and International colleges and universities spent their summer immersed in ocean sciences and engineering projects at WHOI. Read about some of their experiences and research projects here. 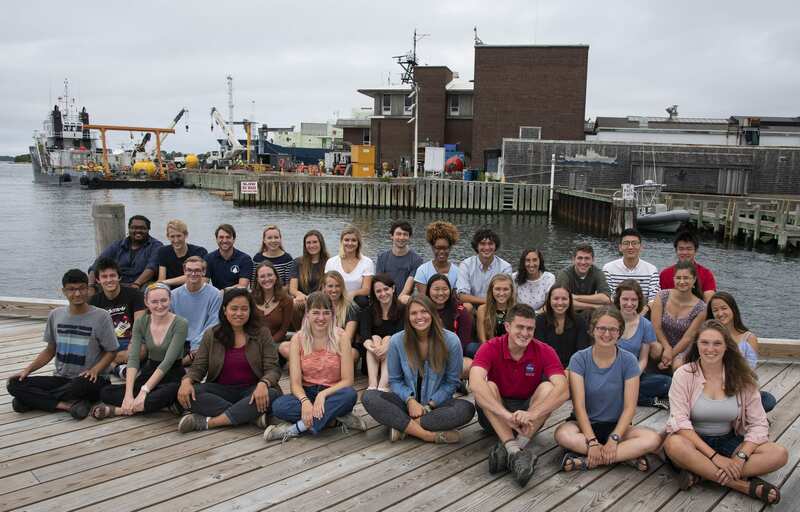 In 2013, 32 Summer Student Fellows (SSF) representing 32 different U.S. and International colleges and universities spent an unforgettable summer immersed in ocean sciences and engineering projects at WHOI. Read about some of their experiences and research projects here. In 2012, 32 Summer Student Fellows (SSF) representing 30 U.S. and International colleges and universities were selected from a group of 192 applicants. Read about some of their experiences and research projects here. WHOI's Summer Student Fellowship was named one of the "25 Most Awesome College Labs" by Popular Science. WHOI Summer Student Fellowships offer a taste of research life. Article from Oceanus Magazine. In 2009, twenty-eight Summer Student Fellows (SSF) representing 25 colleges and universities were chosen from a record high 241 applicants. Read descriptions of some of the fellows and the work they did. Undergraduate students spend a summer getting hands-on oceanographic research experience and working with world-class scientists and engineers in WHOI's Summer Student Fellowship program. Read a blog by fellow Ellie Bors who wrote about her experience working with biologist Tim Shank.